Hi! My name is Nthabiseng, but you may call me Thabby. English has always been one of my favourite subjects while I was in school, now I am very excited to be an English tutor. I hope to assist you in making English one of your favourite languages too! I am a hard worker, enthusiastic and passionate about making a difference. My favourite quote says: "Develop a passion for learning. If you do, you will never cease to grow." - Anthony J. D'Angelo. 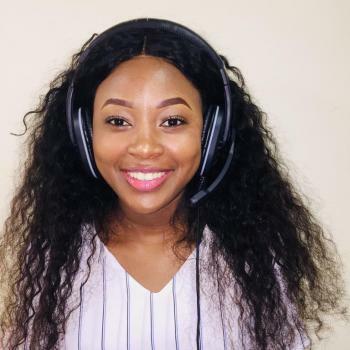 Teacher Thabby is currently completing her Bachelor of Education at the University of the Witwatersrand in Africa and her academic major is English. She was also part of the Representative Council of Learners back in high school as head of culture and was later elected as the academic officer of her university residence. She has taken part and succeeded in various English art festivals including poetry, drama, creative writing, public speaking and debate. Her hobbies include reading and cooking. She has a passion for teaching and she loves working with people. does not know whar the linking sound is, but insists on her wrong understanding. after taking more than 200 lessons, this is the first time i write a negatve comment. I like her lesson, and I want to take her lessons again ! !